We’ve something for all the family - from freshly carved, slow cooked roasts, stonebaked pizzas made from 100% fresh dough, tasty pub classics like hand battered fish, plus a range of burgers and vegetarian dishes. Meals at honest and fair prices, prepared the way you want them with over 50 UK restaurants, easy, online booking. This card may not be exchanged for cash. This card is not a cheque guarantee, credit, debit or change card. No change will be given but the balance can be used for future purchases. We will not be held liable for lost or stolen cards - protect this as you would cash. 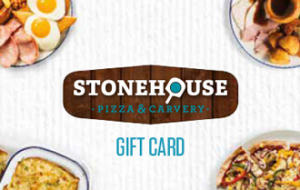 To check the balance of your giftcard please visit www.stonehouserestaurants.co.uk/giftcards. A giftcard is valid for 12 months from the date of purchase. This card is valid for use at Harvester restaurants only. Gift cards can be purchased with a minimum value of £10, up to a maximum of £250. Text and email gift cards should be treated as cash. If deleted they will not be resent. SMS gift cards will be free to receive for the guest. Email gifts are valid either presented on a smart phone or printed out. We reserve the right to amend the terms and conditions. Further terms and conditions are available upon request.